By 146 BC, after the Third Punic War, the Romans were the only important power left in the Mediterranean Sea, and they controlled almost all of its coastline. But there was trouble at home. First, two brothers named Tiberius Gracchus and Gaius Gracchus tried to get some of the Italian land given back to the poor people. But the rich aristocrats in the Senate didn’t want to give the land back. In 133 and 123 BC the Senators themselves, with a lot of their followers, rushed up to the brothers and killed them (on two different occasions)! What is worse, nothing at all happened to those murdering Senators – they just kept on being Senators. Second, those same Africans who had been attacking Carthage were still fighting for more power. They killed a lot of Roman traderswho were living in Africa. So about 100 BC the Romans went to fight in Africa again. But it was hard to get enough soldiers, and the general, Marius, ended up taking poor jobless men from Rome, and telling them he would reward them if they won (which they did). Third, the Italian cities felt that Rome was not treating them well enough. They wanted to be able to vote more. So in the 80s BC there was a war with the Italian cities, under a general named Sulla. This war is called the Social War, from the Latin word for allies, “socii”. It took a long time, but again the Romans won. 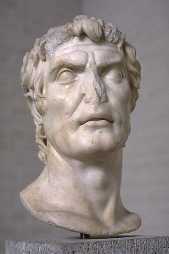 But then Marius and Sulla got into a fight over who would be the general to fight in West Asia. They both wanted to get rich on the plunder from West Asia. Marius won, but Sulla took his army and marched on Rome, and threatened to have his army attack Rome unless the Senate gave him the job. It worked: Sulla went to West Asia, and when he came back he made himself dictator, which meant he could make anyone do anything he wanted no matter what the Senate said. 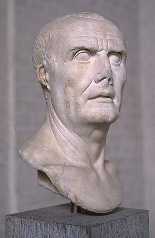 After Marius and Sulla died, it was clear that the Roman Senate was no longer powerful enough to run the Roman Empire. Everyone looked for who the next powerful general would be. To get power, three men joined forces: Pompey; (a friend of Sulla’s), Crassus (a very rich man), and Julius Caesar (a friend of Marius’). We call this group the First Triumvirate (Latin for “the three men”). Between them these men ran the government for about ten years, while Julius Caesar (SEES-ar) conquered Gaul (modern France). 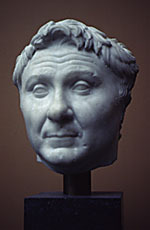 But then Crassus was killed fighting the Parthians in West Asia, and Pompey and Julius Caesar got in a civil war. Again many men died on both sides, but finally Caesar won at the battle of Pharsalus (FAR-sa-luss).Pompey fled to Egypt, but the Egyptians killed him there so Caesar wouldn’t be mad at them. Cite this page: Carr, K.E. 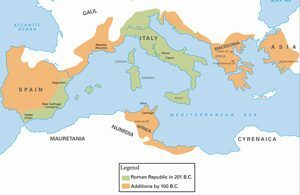 Rome – the late Republic – Ancient Rome. Quatr.us Study Guides, September 2, 2017. Web. April 21, 2019.